OTTAWA – Canadian tax authorities appear to have a bias against express courier companies, and are likely to forgo taxing goods if they are sent via regular post. The results of new research prepared by the research firm Copenhagen Economics on behalf of the logistics company UPS, has shown that tax authorities in Canada apply vastly differing tax rules on e-commerce shipments, based on the type of mail carrier that delivers the package. It was estimated that tax authorities only apply sales tax on a quarter of packages which are sent to a Canadian recipient via a postal service, but tax each and every package that is sent via a express courier such as DHL or UPS. 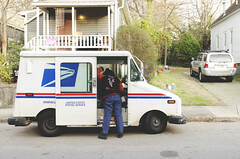 Similarly, duties are only applies in six percent of cases where goods are sent via the postal system, but in 98 percent of cases where the goods are delivered by an express courier. The goods were less likely to be taxed or levied with duties if the goods purchased were low-value, even if they were clearly over the tax threshold. Online international purchases destined for Canadian consumers are subject to tax and levies if the value of the goods exceeds CAD 20.